According to one source, there are more than 194 million blogs already online where 60% blogs are written by professional bloggers. 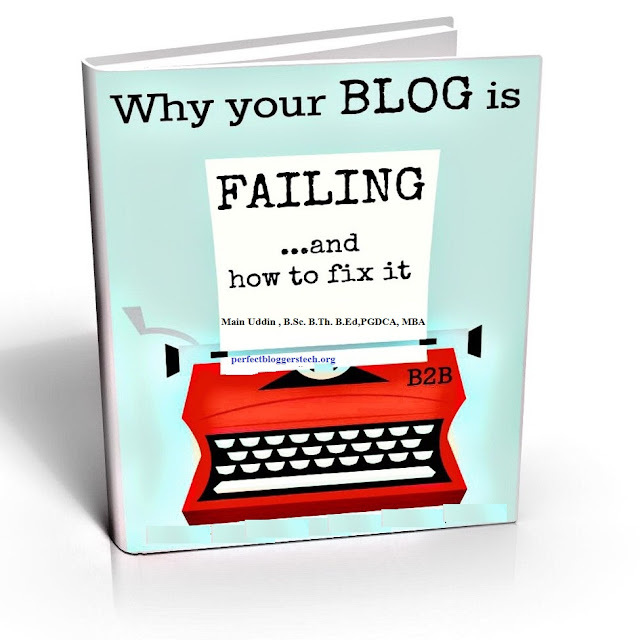 Most of these blogs get less than 1,000 visitors per month, and the harsh reality is, the majority of those blogs are, for lack of a better word, failures. What’s unfortunate is, in that group of people, I’m betting there’s someone just like you. Someone who believed pumping out good content will generate the leads and sales they need to run a profitable business. Someone who believed a journalist or Google would notice their hard work—and reward them with an endless supply of traffic that converts. Someone who put the work in, and things just didn’t pan out. I have been blogging for around 13 years now, and each day presents me with someone who has some kind of blogging failure traits. I notice this easily because I once saw those traits in myself at the early days of my blogging. I never realized until after a prolonged period. Luckily, you can make your own learning curve shorter by taking advantage of the powerful tips from my experience and association with other pro bloggers. The first obstacle is your mind. Talking from experience, your success or failure depends on the disposition of your mind. The perception of your class teacher about you, your poor grades and seemingly poor memory are not the determiners of your success or failure, your mind is. How far you would go in life is not a function of your brain; otherwise, the so called ‘geniuses’ would have been the most successful. Instead, haven’t you wondered that most of the successful people all of the world are school dropouts? Recently, someone who read about my incredible how I achieved Google pagerank 3 & DA 40 in just 3 months commented so negatively on the grounds that I couldn’t have achieved so much over the short period of time I’ve been a blogger. Obviously, his negative mindset is at work, forcing him not to believe that such achievement is possible regardless of my blogging duration. Here’s the lesson; if your mind can picture it, then you can capture it! Doubting everything is also as bad as believing everything, especially when it comes to making money online. In as much as your belief is an essential ingredient to your success, you should also ‘sample’ what to believe as this would help you to be a successful blogger. A friend of mine was already internet-savvy long before I knew what a computer is. He kept date with all the money making seminars and talks. He will come back lecturing me and would often boast of his wealth of information about internet-based opportunities and best techniques. Yet, I’ve made decent dollars via internet-based opportunities in a short time, while this good friend of mine is still struggling to make just few dollars a month. The point is; don’t confuse yourself with all the bulk of information going on over the internet. Filter what you should read and believe. I came to learn in a hard way in the early days of my blogging and internet marketing, that there’s nothing like a get-rich-quick or overnight technique. When I first started out online, I wanted to achieve success fast. Well, you don’t have to blame me because I’m naturally a fast person in virtually everything I do – fast in acquiring my Msc Applied Mathematical Modeling and Computer Science compared to all my mates, fast in talking, fast in walking…just fast in so many areas. So, in my bid of trying to also get it fast in the online arena, I was scammed several times…I simply learnt in a hard way. Here’s the lesson I’m driving at; there is no such thing as overnight success. It’s simple; since you can’t even get rich quick with a conventional business, the same principle applies to blogging or any form of internet marketing. So, you may be asking, what’s the average time required to build a successful blog? Well, from my experience, the more work you put the more you get out of it. And a lot of hard work is required in the aspect of creating informative and appealing fresh contents, plus SEO techniques. If you are only concerned with short term benefit, you will quit too soon from blogging. The most successful bloggers today are those who have patiently groomed their blog with their mind set on the future benefits. So, it took some them an average of five years to start reaping meaningful benefits from their blog. So, if you put in your best now in view of the harvest of the future, you will become a renowned and successful blogger eventually. Becoming a successful blogger requires carefully choosing something you are passionate about and would not quit even if it seems you are not getting result at the onset. So, in the blogging world, the rule of thumb is to start with just one blog in your specialized area and grow the blog to success before thinking of a second niche and blog. Simply put, criticism is part of life, especially a life that is prone to success. Don’t quit or feel dejected because someone criticized your blog post or try to put a question mark on your blogging achievement. I was also a victim of criticism when I first started blogging – the criticism sucked and infuriated me. But now, if I don’t get some criticisms, it feels like I am about to fail! Concentrate on doing what is best instead of fizzling out as a result criticism. It is not a crime to monetize your blog, you deserve some rewards for the quality free values you add to your readers. So, don‘t be scared of monetizing your blog! Don’t just stop at creating quality contents and generating terrific traffic, take it a step further by generating reasonable profit from your blogging effort. You may create the best content, but if you lack marketing expertise your blog would not go far. Excellent marketing strategy is what would place value on your contents and bring the needed reward. So, start thinking more like a marketer in order to succeed in blogging. This is because you are always concerned about generating traffic and achieving high conversion rates. As good as these efforts are, paying more attention to your content is probably the most important. When you offer valuable and relevant content, traffic will naturally flow and higher conversion rate will follow. If you are still running your blog with yesterday’s blogging tips and knowledge, you will end up delivering ‘half-baked’ value to your readers. And of course, most of them would look elsewhere. Don’t be a ‘one man’s island’. Relate with other bloggers, visit blogging forums to learn new things and read the blogs of the pros in your niche. It will help to keep your blogging knowledge up to date and add value to your blog. Digest these truths about blogging success and start implementing them to see result in your blogging career. First you must figure out what sites you’d like to send you some traffic. So, for homework, I want you to leave a comment on this blog post. Here’s what you should include in your comment: First, I want you to list your 1 DREAM website that you would LOVE to get a link from. (Notice I said “dream” website. Shoot for the stars!) Second, I want you to list 3 other websites that you would also LOVE to get a link from. Don’t pick the biggest websites in the world, but instead, pick some smaller sites that you think would do your brand well.